We are delighted to announce that WATSAN will be presenting at The Funding Network in Oxford in May 2018 – a live crowdfunding event where we hope to raise £3,000-£4,000 for our Bwambara project. The Funding Network (TFN) describe their events as “a friendly Dragon’s Den”. At the event, four charities pitch a project for funding to an audience of around 100 donors. Each charity has just six minutes to sell their project to the crowd, then six minutes to answer any questions. After all the charities have pitched, audience members take part in a live bidding session, pledging donations starting at around £100 each to support the projects that inspired them. 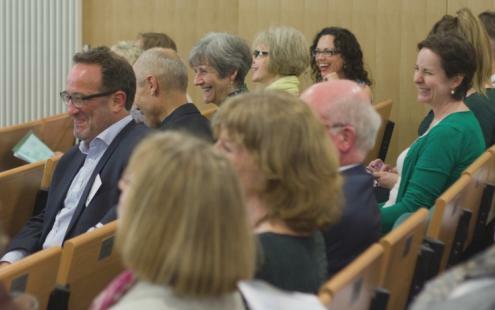 At the Oxford event, which has been run annually for the past ten years by a team of local volunteers, charities typically raise around £4,000 each when they pitch. Getting through to the event required WATSAN’s trustees to complete a detailed application form, and we were shortlisted from a much larger pool of applications. We also did a rather nerve-wracking one-minute pitch to the panel over the phone, which gave an insight into how challenging the real thing will be! Trustee Kate Parrinder will take the stand to make the pitch at the event, and will appeal for funds for WATSAN’s Bwambara Hill project, a community of around 1,500 people that has suffered severe drought and crop failure. The nearest water source is the Rushaya River, four kilometres away by foot. We will ask donors at the event to consider funding one of the three planned rainwater collection tanks in the community, along with associated software/education. TFN takes place on Thursday 17th May 2018 from 6.00pm at the Ship Street Centre, Jesus College, Oxford. It promises to be a fun and inspiring evening out, and the chance to hear from WATSAN plus three other small local charities (Ark T, Oxford Against Cutting and Human Story Theatre). We would like to encourage as many supporters to attend as possible – you can book tickets here!